Guest columnist Wendy Nan Rees shares safety tips for walking your dog at night. If you're out walking your dog at night, you probably realize that there are certain risks involved. One of the biggest is the issue I want to talk about today, and it's about not being visible. I have a wonderful friend named Jason who helps me walk my three dogs every day. Our biggest problem is that he comes home late from school, and at this time of the year it is usually already dark. I've always worried that any of the boys could slip off the lead, and how would we find them in the dark if they decided to take off? Now I have used a lot of collars in my day, and some of them were designed to light up in the dark. The problem has been that they didn't glow very brightly, and the dogs didn't have to move too far away before it became difficult to see exactly where they were. I recently found a collar that I think really does the job, so I wanted to tell you about it. 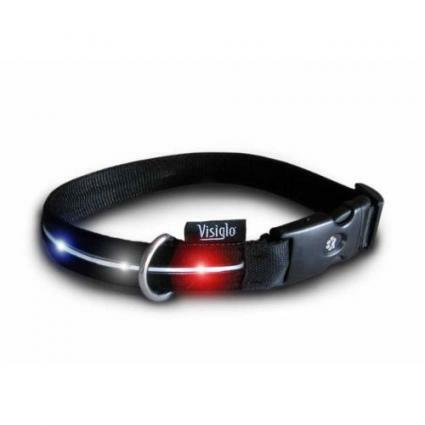 The collar is made by Visiglo and they make glowing leashes too. The collars come in three sizes so they will fit most dogs. The great thing about this line is they have really thought of everything for the consumer. They have eight different styles that each serve a different purpose. Visiglo is also slowly adding new safety products to their line, and I can't wait to see what they come up with next. As I've said, I have tried three other light-up collars, but they were bulky, ugly and they didn't light up at much of a distance. My faithful assistant Ruthie tested a Visiglo collar during a Minnesota blizzard and could see it over half a mile away. Now that is a light up collar that works! Here are some more tips for making you and your dog more visible whenever you're out walking after dark. Be sure to wear light or bright clothing. Purchase reflective tape and add a strip to your clothing where it can easily be seen. Think about purchasing and wearing shoes equipped with either reflectors or LED lights in the heels. Avoid walking along the road, but if you have no other option, be sure to walk against the traffic. This way, you can see oncoming traffic, and hopefully they will see you too. Be sure to keep you dog on the side farthest from the road.